The key to successful calving is cow condition. Cows should be fit – not fat – when they calve down, ideally a condition score in the range 2.5-3 at calving. Overfatness comes from over feeding in late lactation or the early dry period. Cows should be at the target calving condition when they are dried off, 8 weeks pre-calving. This is because the calf does most of its growing in the last 8 weeks of pregnancy, (just as lambs do) but because most cows only give birth to a single calf, the energy demands of the growing calf are easily matched by the appetite of the cow. If the cow is allowed to feed to appetite on good quality forage (either grass or silage) she will consume far more energy than she needs, increasing the risk of an over-sized calf and storing any excess as fat. Both can lead to calving difficulties and fertility problems. Large fat deposits in the birth canal may impede the passage of the calf. But probably of greater importance is that fat cows lose their appetite earlier than fit cows as calving approaches – and are slower to regain it post calving. The reduced feed intake precalving, means that magnesium intake also falls and this reduces her ability to mobilise calcium from her bones. A modest reduction in calcium availability reduces the ability of the womb to contract, prolonging the first stage of labour (“Slow Calving Syndrome”) whilst a more serious calcium deficiency can lead to milk fever. Maintaining blood magnesium levels helps to maximise both calcium absorption from the gut and mobilisation from bones, dramatically reducing the risk of milk fever. What is often not realised, is that cows which have had milk fever have a reduced resistance and are therefore much more susceptible to a whole range of subsequent conditions such as retained placenta, mastitis, metritis and fatty liver syndrome. Milk fever is one of many livestock problems where “prevention is better than cure”. 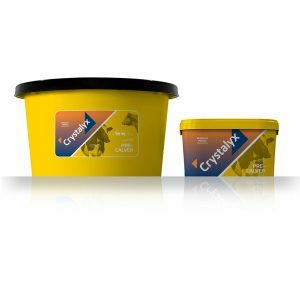 Crystalyx Pre-Calver contains a unique combination of magnesium salts to optimise uptake and availability within the cow to help maintain blood magnesium levels as calving approaches, which will significantly reduce the risk of milk fever. The presence of sodium also helps to reduce the antagonism to magnesium availability caused by high forage potassium levels. The high sugar content in Crystalyx Pre-Calver increases microbial activity, which can stimulate dry matter intakes in the run up to calving. This ensures the poorer quality forages, especially straw, fed during the early dry period to prevent excessive weight gain, are digested efficiently. Crystalyx Pre-Calver also contains generous levels of all trace elements to help replenish body reserves prior to calving and promote a strong immune response within both the cow and calf – important for calf health and vigour and to reduce the risk of mastitis in early lactation. The high levels of vitamin E and selenium also help to reduce the risk of retained afterbirth post-calving. With typical intakes averaging 200g/cow/day, feeding Pre-Calver for an 8 week dry period represents an investment of only approx. £11.00 per cow. This entry was posted in Crystalyx News and tagged beef cows, calving, dairy cows, dry cow, pre-calving, spring calving, supplementation.